We've said it before but it bears repeating: desktop systems are getting smaller. ATX is becoming less and less necessary, and mini-ITX-based machines more and more offer the same performance and features that their bigger brothers do. That's just the direction of the technology industry as a whole, cramming everything we need into a space half as large. What's specific to cases is their own evolution running parallel with the technology we're putting into them. 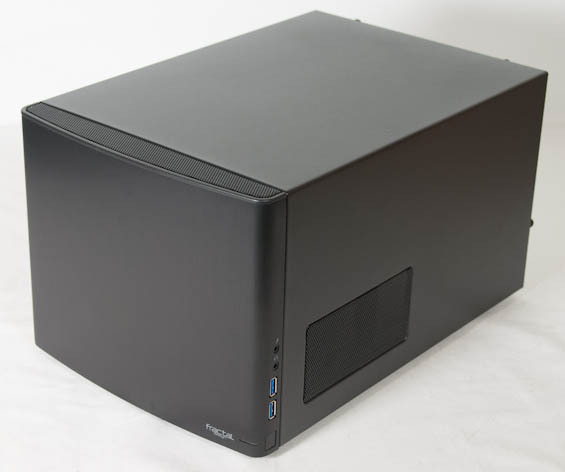 Fractal Design's Node 304 is in many ways a surprising jump forward in case design. We've seen SilverStone, BitFenix, Lian Li, and Cooler Master all try their hands at mITX cases with varying degrees of success, but there's just no set design language when you get down this small. The conventions we take for granted in ATX case design don't really apply here, but Fractal Design has tried for something fairly different with the Node 304, even by mITX standards. You can immediately see from the photo that some things are missing. Fractal Design has ditched the optical drive bay entirely and saved a lot of space in the process. You may not have noticed that there's also no reset button; HDD activity and power are both handled by the same single blue front LED. Ventilation is pretty minimal, too. Fractal Design took their usual aesthetic and a lot of chutzpah and produced something remarkably unique. Dimensions 9.8" x 8.3" x 14.8"
Fractal Design is essentially targeting the Node 304 to be used as a quiet file server, but when I tested it, that wasn't really what I was thinking about. The fact is, for most users, what's really missing on the spec sheet? There's ample space for internal storage, and the things we'd put in external bays can be just as easily connected over USB 3.0. About the only thing that couldn't easily be added is a fan controller, but Fractal Design already included one. I'm a pretty big fan of Fractal Design cases; this looked quite promising (especially by the specs on the first page) until I got to the point where I read Dustin having issues getting the 560 Ti inside. I have maybe--MAYBE--used my optical drive a handful of times in the past 5 years. And almost all of those times I could have gotten away with using an alternative method (bootable USB, backed up ISOs, etc.) and am glad to see it omitted completely. Even in large desktop cases I'm starting to wish they would get rid of 5.25" bays completely and just give me 10-12+ internal 3.5" drive bays for massive RAID/fileserver setups (I have had my eye on the Fractal Design XL for a while now). Only reason I see myself using a 5.25" bay is for a hot swappable drive bay...and I don't use those often since I have a NAS that supports that. But I am amassing lots of old 640GB (have 4) and 500GB (have 4) drives and I use 4x128GB samsung 830s in raid0 as my boot...would be nice to RAID 5 the 640's and the 500s in a case though and maybe kill my NAS since my computer is almost always on anyway. I had the same reaction. It sounded like my dream case until I got to the part about it not handling the 560 Ti. I have a New Egg wishlist just begging me to hit the buy button with a Lian-Li QB25 case. I just can't do it because I'm on the fence about the case. The specs I have call for a 660 Ti GPU and a SILVERSTONE ST45SF-G PSU. The PSU used for the review is 7" deep while the one I've picked is less than 4" but I still worry about how much clearance there will be for the modular connectors. and yet, neither of you noticed that he is using a psu that is beyond fractal's spec. with a shorter psu, you'll fit a hell of a graphics card in there just fine. I use standard hardware, but you WILL be able to fit a GTX 560 Ti (albeit probably barely) or even a 680 in this case if you put a smaller PSU in. You really don't need a super power supply in these things. The GeForce 680 has a TDP of 195W, the i7-3770 has a TDP of 77W. Those are the two most power hungry components, and you're only at 272 watts. Shuttle ships their mini ITX cases with a 500W PSU and certifies both of these components (actually up to 95W on the CPU, but I don't think any go that high yet). A good quality single-rail 500W PSU is probably enough for almost any Intel consumer desktop unless they're getting crazy with multi-GPU or insane numbers of hard drives (like my fileserver which has 15 hotswap bays :P). May as well call it 300W peak after adding a HDD, and optical drive. a Tad more with an SSD in addition. Problem is, any modern PSU to be the most efficient . It needs to be loaded at 50%. So we're again talking 600W for a PSU. If efficiency is not all that important, then you can futz around a bit but going under 500W will only be a problem with any power hungry GPU. e.g. the system stands a better chance of being less than rock solid stable. Now I can not speak for anyone else, but for me rock solid stability is a must in any build. However, i also would not require a beast of a graphics card either. Lastly, not all PSU;s are created equal. So you're not necessarily guaranteed even 50% of the power total provided on the 12v rail. Assuming a single rail PSU. Most that I would trust being made by seasonic, while being branded by different companies. Antec comes to mind ( earthwatts 500 ) I've owned one now for 4-5 years and am perfectly happy with it. Granted, as stated above, i do not require a massive GPU.. Mostly i opt for mid range. Seems to me that what we need is for the industry to standardize on a set of connectors for modular PSUs. That would allow an aftermarket to develop for modular PSU cables of any length you need. Like in this case it looks like the main power connector only needs to be around 8" or so, if that. There are outfits that sell custom modular cables for select PSUs (e.g. Seasonic X-series) but they are ridiculously expensive.